Maybe you’re waiting for that summer job or internship and find yourself with hours to kill. Or perhaps you’re just plain bored. Whatever the reason, if there’s time on your hands, we have the perfect way for you to spend it: Watching a Youtube channel called DIY Fake Food. If you’re like most people, you probably like food. And if you have a heart, you probably can’t resist finding tiny versions of everyday objects absolutely adorable. On this Japanese Youtuber’s channel, you can have the best of both worlds as you watch him make everything from tiny potatoes to doll-sized boxes of the popular snack, Pocky. The channel features dozens of colorful videos displaying fake gourmet desserts, drinks, and meals that all look delicious enough to eat. Each miniature food is carefully crafted to include all the intricate details of the life-sized counterparts. Although you may be content to just watch this artist work his magic for hours on end, some of you may be dying to get your hands on some mini cakes or noodles of your own. Each video is a step-by-step tutorial that shows the process of creating each dish from start to finish, including all of the materials and tools needed. However, many of us may not have the skill (or patience) to create our own. 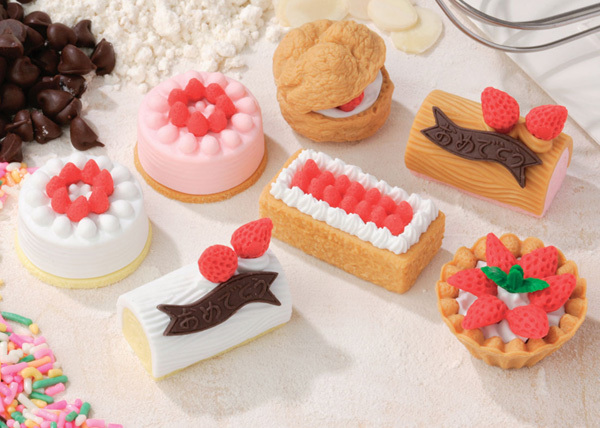 In that case, you can get your tiny fake food fix with these adorable Japanese erasers from Iwako that are *almost* as amazing as the Youtuber’s handmade doll snacks.